We said goodbye to a longtime co-worker and friend this past week. And, judging by the hundreds of people at his remembrance gathering, his life had a powerful impact. The eloquent reflections presented at his service provided a summary of a man who could teach us all a few things. There was coaching and leadership: Scott ‘Stump’ DeShields was a mentor who made a difference to future generations. We met Scott because he coached our brother in high school in the early ’90s. In more than 25 years on the sidelines, Scott never hesitated to get in a player’s face and order him to “get his head out of his duffle bag,” but he also didn’t hold back with an arm around the shoulders for a player who needed encouragement or support. They knew his booming voice of instruction, but they also discovered that he really cared. There was a passion for excellence: Scott held us all to the highest standard. Whether it was in tile, football, or being on time, Scott didn’t accept excuses. “Do your job,” meant Scott was calling you to do your best, to do what you were capable of, to not accept less than your 110 percent. There was loyalty: Scott was the essence of a ‘foxhole buddy.’ If Scott counted you in his inner circle, he’d do anything in the world to back you up, to come alongside – no matter what. He might call you to task later on, but there was no question as to whether he would be there for you. Even when our dad was in his last days and struggling with his surroundings, he frequently asked for ‘Stump’ to come help him. There was family: Scott loved his wife and kids beyond measure. His face lit up when he talked about their achievements and plans for the future. He always wanted the best for his children, and they are truly excellent young adults. They will continue to be a very proud legacy for him. There was personality: Scott would agree that he wasn’t always the easiest person to work with, but he was always himself. Our homogenous world has watered down the ‘characters’ among us, but Scott wasn’t really bothered by social norms. He was true to what he believed, to the people he loved, and to his passions in life. He was true to himself. Nyle’s salute to Scott at the service was perfect: “To you and those like you. Damn few left.” May we all try to take the best of ‘Stump’ with us into our coming days. 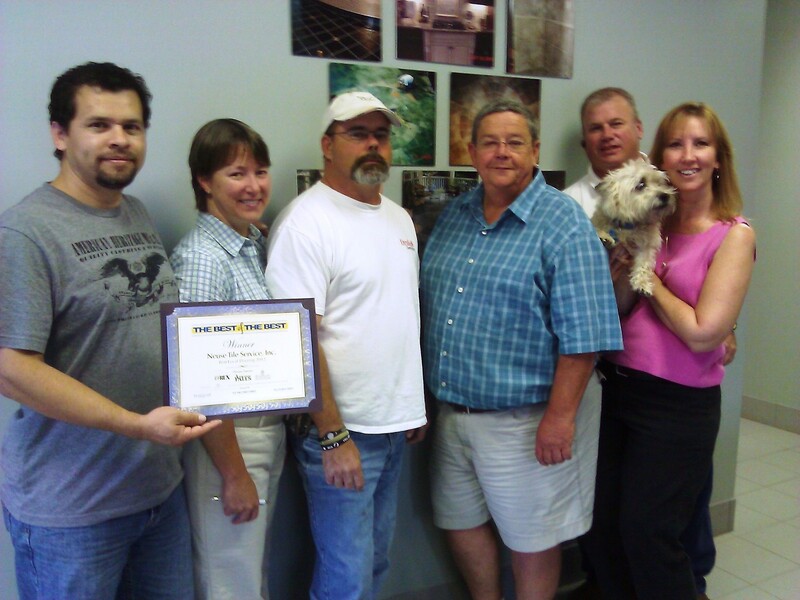 Categories: Local business | Tags: Neuse Tile history, tile professionals, Wadford history | Permalink. It’s a new year, and we’re hoping for a good one! As we’ve been doing our end-of-year analysis and new-year planning, we are reminded of those who make our existence possible – OUR CUSTOMERS! We’d like to say ‘Thank You’ to all who have given us the opportunity to participate in your projects. The miles of tile we’ve installed in the Triangle area wouldn’t have happened without the thousands of homeowners and builders who have trusted us with their installations. Some of our builder and remodeler friends have stayed busy through the downturn, and, because their business has been built with a reliable team, they stayed true to their high-quality subcontractors. Others have found us more recently because they needed reliable, quality tile installations done at a fair price. So, in an effort to say thanks and help promote their great work (with positive Google searches), we’ve added some contractor credits to our website photos. They’ve kept us going in 2014 (and in previous ones), and we appreciate them! Check out their beautiful work (highlighting the tile, of course) at www.NeuseTile.com. We’ve labeled photos with a lot of contractor names and are adding to the info. every day. Also, as we were reviewing our data, we realized that several of our contractor customers have been working with us for almost 20 years, so we’d like to give a special thanks to: Jay at Beaman Building & Realty, Mark at Massengill Builders, Jim and Dan at J.L. Williams Construction, Mark and team at Prime Building Company, Walt at Dillon Construction, and to Kemp Harris Inc. You guys have lived through the ups and downs with us, and we greatly appreciate your loyalty and your good work!!! Here’s hoping 2015 will be a good year for all our local contractors and for those of us who are part of their teams! We’d love to add to our list and help make sure the area’s quality level remains high. If you have a builder friend who is tired of headaches and no-shows from his current tile guy, tell him or her to give us a call. We’d like to keep adding to the miles of tile we’ve installed for the area’s great contractors. And, if you want a recommendation for a general contractor for your next project, give us a call. Categories: Ceramic tile, Installing tile and stone, Local business | Tags: Customer satisfaction, Local tile expertise, Neuse Tile history, Quality tile install, Raleigh tile installer | Permalink. Our family business is on its 2nd generation of owners but we’re also on our 2nd generation of tile installers. And, since most of them are over 35, we’re starting to think about who comes next. And we’re a little concerned. Ours is an artistically rewarding business with practical and beautiful finished work. The trends and materials are ever changing, so the trade can be one of growth and opportunity. A good tile installer can provide for his family and find daily rewards in a job well done. We are, however, still part of the construction industry, and we’re finding that’s not a popular career choice these days. The recent recession hit the trades particularly hard, and many experienced workers had to find other means of making a living. Statistics show that these departures, baby boomer retirements, and a decreasing number of workers entering the construction fields are likely to bring significant shortages. 1) “Let’s agree not to take the trades for granted. Some observers and service company owners believe a general devaluing of skilled labor – a societal stigma, even – is one reason for the shortage. 2) Look around where you live. Do vocational education opportunities exist? Is that an issue you might get involved in? Do you have a skill set you could pass on to the next generation? Categories: Installing tile and stone, Local business | Tags: Customer satisfaction, local tile, Neuse Tile history, Quality tile contractor | Permalink.